These bags exhibit the perfect blend of traditional Indian culture and contemporary style. All the bags under this section are made of fine fabric & comes with mesmerizing embroidery. These bags are apt to be carried to any occasion, as they can be your style statement. 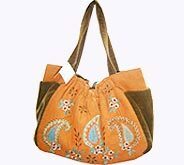 Desc : Beautiful & multicolored paisley, floral and leaf designs have been created by the agile hands of our experienced artisans in this orange & brown embroidered bag. 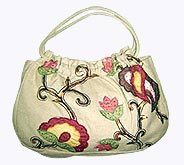 Desc : Charming embroidered handbag reflects skilled needle work in form of varicolored floral and star designs on black fabric. 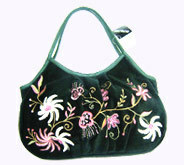 These ladies handbags can be put on shoulder snugly with wide strap. Desc : Blue & green floral and leaf patterns have been printed on colorful striped background. 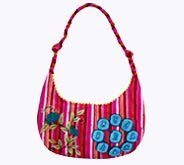 This hobo style embroidered shoulder bag looks marvellous on sarees, salwar kameez, tops, skirts & other apparels. Desc : Exhibition of artistry, beauty and talent. 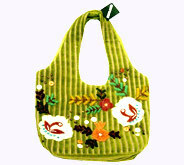 Hand embroidered bag portrays the stunning designs of flowers & leaves of multiple luscious colors on white fabric. 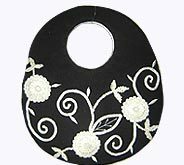 Desc : Fabricated in oval shape, this black colored ladies embroidered bag possesses white embroidery of flowers & leaves. They have a round cut at top for cozy clutching. Desc : Must possess for who love natural beauty. Showcasing the fascinating color combination through stripe, floral & leaf designs, this embroidered fashion bag has made waves in fashion world. 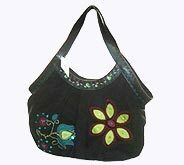 Desc : Black colored embroidered ladies hobo bags with blue border & handles possess bewitching embroidery designs. These bags can be used for practical as well as decorative purposes. 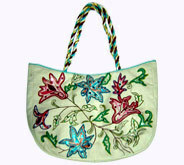 Desc : Embroidered tote bags display the red, blue & green colored floral designs on white fabric. They have colorful twisted & smooth handles at the top for soft hands of the ladies.